IN this crazy melting hot weather a few adventures came my way of the eating kind and the non-eating kind if you know what I mean. First the sister from New Zealand arrived loaded with gifts like Manuka honey, Whittakar’s dark almond chocolate (62% cocoa), some Shaw’s Berry Farm’s Kiwi Fruit Jam (the honey and chocolate was welcome, the jam was not, although it is quite delicious!) and a few other temptations of the luxurious bathing kind. She asked over the phone, “I’m here for a couple of days for a shaadi at Planet Hollywood. Want to come over? It’s a Gujju wedding and Alpaben (mother of the groom) says you’re also invited as family!” I smiled and said there’s no way I could run away for some fun in the middle of a working week and that too for marriage shenanigans of one of our high end shaadi affairs of the very khaas aadmi kind. King of Good Times” liquor baron Vijay Mallya’s Kingfisher Villa at Candolim). The 32 years old something Sachiin Joshi of the JMJ group of companies is from the sound of it a keen adventuring and sporting businessman (remember him from any of his films, Aazaan, Mumbai Mirror, Jackpot). DRIVING down south Goa we kept getting lost despite the excellent GPS guiding us, but soon arrived at Planet Hollywood. Unimpressive oasis frontage but beyond that a huge estate sprawls out to overlook Utorda beach. Very art deco-ish and low complex with mammoth black stone Ganpati-bappa and Buddha, water landscapes and a very stylish swimming pool. Mediterranean with filmi touches here and there – an entire wall covered over with familiar Hollywood filmstar faces (at Heart Bar I think). The sister took me up to her room where an extra king-size bed was piled high with colourful satin pillows and bedspreads, gorgeous see-through windows, etc. I was mesmerized by the mother-of-pearl rainbow sheen of the tiled bathroom. Planet Hollywood’s interiors are reportedly courtesy Gauri Khan (filmstar Shahrukh Khan’s wife—she’s made a name for herself as an out-of-the-box creative designer). The place was packing up with arriving guests being welcomed with tilak-aarti, kokum sherbat (very thirst-quenching) and we wandered around a bit with various folk inviting us for this, that and other functions. After the greetings, the bride’s mother, Alpaben Kapadia said at least put some mehendi on your hand for “shagun” before you go home. I put out my hand and a young mehendi artiste painted a lovely floral design (do you know that mehendi gets darker for a while as the days go by?) and then it was lunch at Fame restaurant, where I must say the lunch was freshly cooked and very satisfying, a perfectly appointed but not overwhelming buffet. They do a sublime vegetarian lychee panna cotta to live for! A see-through kitchen offered a picturesque scene of chefs at work. The sis said, “Wear something glamorous and come for the shaadi tomorrow. There’ll be mango raas for the marriage feast!” What’s a Gujarati marriage party in summer time if there’s no shudh aam raas (to be enjoyed with a teaspoon of desi ghee and a pinch or two of soont (ginger powder)? I didn’t go but the sister filled me in. It was a grand and generous shaadi with some 200 plus, plus friends and relatives. Your typical traditional Gujarati shaadi with modern tidbits like a poolside high tea thrown in! (It’s besides the point that I personally think young folk should get married in a temple of old which features a kalyana mandapa, I’m so old-fashioned!). I dropped in at a Pink Room Salon & Spa offering some terrific sounding massages of the Ayurveda and non-Ayurveda kind. Want to enjoy an Aloe Jasmine or Rose and Almond body wrap? There’s also a coconut and sugar body polish. Which reminds me, both interiors and exteriors at Planet Hollywood are scented with a tantalizing jasmine oil aroma in the air and I caught myself taking deep breaths for a jasmine high! WHO got married? Loving young couple Kushant Kapadia with Mitee Hora. I’m afraid I didn’t get to meet the young couple though, but wish them lots of my jug jug jiyo and forever after good things of life’s blessings. It makes sense to marry young in one’s 20s. Marry late in life like me and a lot of life’s blessings get lost in the winds of time. Planet Hollywood? One of these day do a visit for a meal in their restaurant Fame and lounge a while at the Heart Bar to unwind with a glass of wine near by. 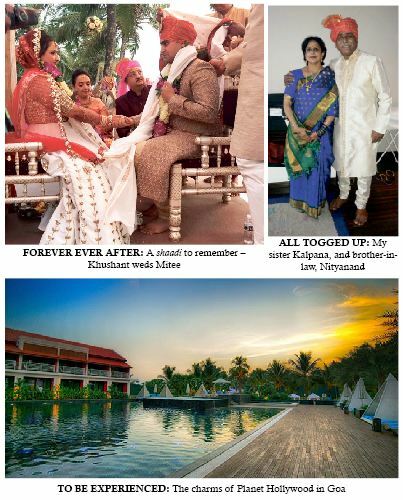 Goa’s five-star venues definitely continue to attract marriage parties. It’s like everyone has a great time with very little work to do – the hotel management fixes it all for you. How much can a wedding do like this cost? The sister replied blithely, maybe something like `4 crore. But nowadays the bride and bridegroom’s families share expenses equally. “What all I could have done if I had that kind of money to burn…maybe even bought you a home of your own to live in Goa!” It’s the thought which counts from a favourite sister of mine. Thank-you!